Pull the high beam stalk while unlocking the car from the fob. IIRC this disables DRL. Lock does the reverse. Yes. on the diesel, it is literally a 2 second job. - To turn off DRL’s, with key fob in hand (engine and ignition off), simultaniously press the ‘unlock’ button on the key fob and pull the light stalk towards you (high beam flash-to-pass). You will hear a beep. Your DRL’s are now off. - To turn the DRL’s back on, use the same procedure replacing “press the unlock” with press the lock button. Your lights can now be turned on and off in a normal manner with the switch on the light stalk. If you wish to continue to have some sort of DRL, what I did was move the Canadian-positioned turn signals back to their originally intended location in the headlight pod. Then replace the 1157 bulbs in the grille with 1157 LED's (available at Cdn. Tire and Princess Auto) and run an ignition operated live wire to both. Turn the key on, and viola, you have DRL's bright enough to satisfy the boys in blue, and you don't burn out your normal headlights as quickly. I have had my '05 Pulse for over 9 years, and have never had to change a bulb in all that time. My apologies to MikeT for repeating the answer. Post #300 was at the bottom of the previous page so I didn't see it until my answer was posted. Awesome little trick I must say! Will have to try it out soon when I head off to work. Going to try and replace the headlight by just taking off the passenger front access panel, instead of taking the front clip off. Sounds like it has been done that way so why not save the time if you can right! I must say, for a vehicle for, definitely is the best for fast responses and help....much appreciated everyone! Pretty sure that worked, awesome trick. this granny style driving tank got me 652km to 22L. Good enough for me! The 2nd half of the drive home I went from being the slow person to the car passing 99% of vehicles again, and it felt great! After I turned off my DRLs on the 450, I installed a bright LED bulb in the "city lamp"
Glad to see that you're happy with the results! That works out to about 83.7 miles per gallon. Nice job. I think I got a 600 km tank once. But I usually drove the snot out of my cdi, so my tanks were usually in the 500 to 550 km range. If you do the turn signal mod, you can also repurpose the dash dimmer button below the drawer (to the left of the interior light/switch). Pop the button out, and fish around inside, and you’ll find another set of wires with a connector taped in there. Fish it out, and swap it with the wires already on the switch, and you now have a button that activates the lights in the “fog” position. Ya It was a nice test to see what the car could do if I wanted to drive slow for maximizing mpg. I will try driving my normal speed on a super tank next to see what kind of mpg I get. Anyone have or know where to find that rear cargo storage compartment that fits the 450 I believe? Ya the perfect ideal vehicle is probably a tdi golf or jetta as it gets good mileage and it is still a car that is useful. I have a civic though, and it isn't worth much to sell as it has lots of clear coat paint peeling so while it runs great, it won't sell for much. Otherwise I would consider maybe getting a tdi as you can tune them quite a bit if you want so choose. My 450 Cdi is as fast as any car on the roads here. It once did Banchory to Dover in just under10 hours. You'd have a hard time beating that in any fast car due to speed cameras nearly everywhere these days. I have a civic though, and it isn't worth much to sell as it has lots of clear coat paint peeling so while it runs great, it won't sell for much. I too, have a Honda Civic. It will be 30 years old in September, and I am the original owner. With 496,000lms on it, it still gets great gas mileage pushing close to 50 mpg (5.6 L/100k) when not towing a trailer. Reliable as an anvil. No plans to EVER sell it. installed oil pan with drain plug today. Great deal from germanparts.ca and super fast shipping. Think next I will attempt to do the fuel filter which I think is located under the plastic protector panel on the drivers side? 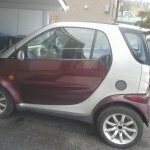 Well due to some unfortunate circumstances I have given back the smart car to the family member I got it from. They no longer have a vehicle and can't afford to get one so I think I did the right thing by giving it back, even though I will now pay double for fuel per week. Will keep my eyes out to see if I can find a cheap smart, which I find unlikely. Seems like some vw tdi's are getting a lot cheaper so may look that route also, but they do have 300k km on them or more. For now just the civic will do. Thanks for all the help over the last two months or so. I may still lurk around here from time to time. Sorry to hear this, will keep my fingers crossed for you to find another smart.......good luck. There are cheap smarts to be had in the Vancouver area. Be ready with cash.